Can I roll back to Mavericks? Discussion in 'OS X Yosemite (10.10)' started by Shocco, Jun 12, 2014. Installed Yosemite but am looking to roll back to Mavericks is it as simple as creating a bootable Mavericks USB then reformatting the drive in the recovery partition and installing from USB? Yes. I don't know if Yosemite replaces the Recovery partition to a newer one, but you can simply go to the Recovery partition by holding Option at bootup, clear your Yosemite partition and simply reinstall Mavericks from there. Yosemite actually deleted my mavericks recovery partition. You'd be better off booting up from the mavericks usb and using that to erase the entire drive and then install mavericks again. You should be able to do all of this from the bootable usb. Alternatively you can also use it to restore from a time machine backup of mavericks made before you upgraded to Yosemite if you did such a backup. Apple advises to do such backups anyway. Yosemite converted my entire Disk to a Core Storage Partition and I had to Google how to Partition my Drive to reinstall Mavericks. Yosemite did update my Recovery Partition. Yeah no restore partition and it wont boot from the internet either. Interesting, so when one creates a partition/formats their drive with Yosemite it makes it a Core Storage partition or did you already have a Core Storage partition and Yosemite converted it to the newer version that it now uses? Give this whole thread a read. 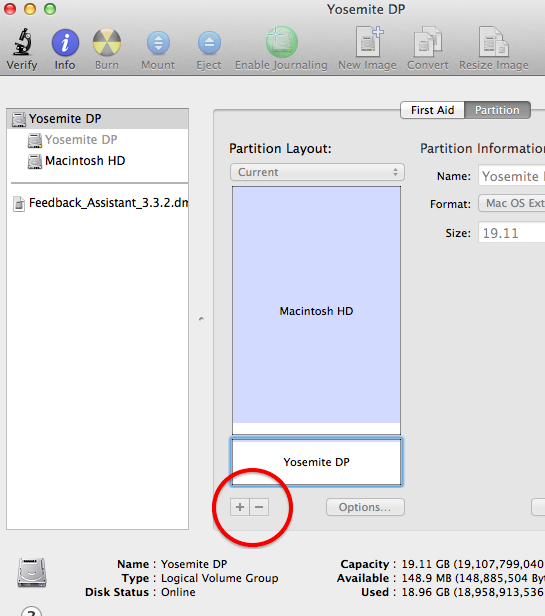 If you install Yosemite on a second partition, that partition is setup as core storage. It does not convert the first (Mavericks) partition to core storage though. Does this just apply to SSDs? I installed Yosemite on a separate partition and it's not setup as core storage. It also did not erase my Mavericks recovery partition either. I don't think so. The people that have been reporting this issue seem to be both HDD and SSD users and they all installed Yosemite on a second partition. Odd it did not happen to you. Indeed. This is what happens when I run the command diskutil list in terminal. Looks like you were not afflicted with the core storage issue. I attribute it to clean living. I just did a recover boot on start-up and restored from my time machine backup right to 10.9 (Maverick). Of course I backed it up before I installed 10.10, so if you didn't it's a full install. The Partition was just a Standard format for OS X. It converted it during the upgrade for some reason. I can't seem to click the "-" (minus) button in Disk Utility to delete this second partition. I have tried in recovery mode, and tried ejecting the partition, but no joy. What am I missing?